Serverless computing refers to an architecture discipline that allows you to build and run applications or services without thinking about servers. You can focus on your applications, without worrying about provisioning, scaling, or managing any servers. You can use serverless architectures for nearly any type of application or backend service. AWS handles the heavy lifting around scaling, high availability, and running those workloads. The AWS HIPAA program enables covered entities—and those business associates subject to the U.S. Health Insurance Portability and Accountability Act of 1996 (HIPAA)—to use the secure AWS environment to process, maintain, and store protected health information (PHI). Based on customer feedback, AWS is trying to add more services to the HIPAA program, including serverless technologies. AWS recently announced that AWS Step Functions has achieved HIPAA-eligibility status and has been added to the AWS Business Associate Addendum (BAA), adding to a growing list of HIPAA-eligible services. The BAA is an AWS contract that is required under HIPAA rules to ensure that AWS appropriately safeguards PHI. The BAA also serves to clarify and limit, as appropriate, the permissible uses and disclosures of PHI by AWS, based on the relationship between AWS and customers and the activities or services being performed by AWS. Along with HIPAA eligibility for most of the rest of the serverless platform at AWS, Step Functions inclusion is a major win for organizations looking to process PHI using serverless technologies, opening up numerous new use cases and patterns. You can still use non-eligible services to orchestrate the storage, transmission, and processing of the metadata around PHI, but not the PHI itself. In this post, I examine some common serverless use cases that I see in the healthcare and life sciences industry and show how AWS Serverless can be used to build powerful, cost-efficient, HIPAA-eligible architectures. Running HIPAA-compliant web applications (like provider directories) on AWS is a common use case in the healthcare industry. Healthcare providers are often looking for ways to build and run applications and services without thinking about servers. They are also looking for ways to provide the most cost-effective and scalable delivery of secure health-related information to members, providers, and partners worldwide. Unpredictable access patterns and spiky workloads often force organizations to provision for peak in these cases, and they end up paying for idle capacity. AWS Auto Scaling solves this challenge to a great extent but you still have to manage and maintain the underlying servers from a patching, high availability, and scaling perspective. AWS Lambda (along with other serverless technologies from AWS) removes this constraint. The above architecture shows a serverless way to host a customer-facing website, with Amazon S3 being used for hosting static files (.js, .css, images, and so on). If your website is based on client-side technologies, you can eliminate the need to run a web server farm. In addition, you can use S3 features like server-side encryption and bucket access policies to lock down access to the content. Using Amazon CloudFront, a global content delivery network, with S3 origins can bring your content closer to the end user and cut down S3 access costs, by caching the content at the edge. In addition, using AWS Lambda@Edge gives you an ability to bring and execute your own code to customize the content that CloudFront delivers. That significantly reduces latency and improves the end user experience while maintaining the same Lambda development model. Some common examples include checking cookies, inspecting headers or authorization tokens, rewriting URLs, and making calls to external resources to confirm user credentials and generate HTTP responses. You can power the APIs needed for your client application by using Amazon API Gateway, which takes care of creating, publishing, maintaining, monitoring, and securing APIs at any scale. API Gateway also provides robust ways to provide traffic management, authorization and access control, monitoring, API version management, and the other tasks involved in accepting and processing up to hundreds of thousands of concurrent API calls. This allows you to focus on your business logic. 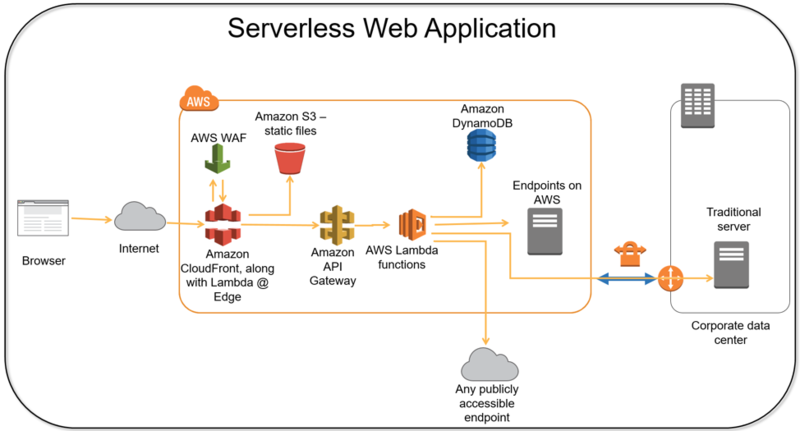 Direct, secure, and authenticated integration with Lambda functions allows this serverless architecture to scale up and down seamlessly with incoming traffic. The CloudFront integration with AWS WAF provides a reliable way to protect your application against common web exploits that could affect application availability, compromise security, or consume excessive resources. API Gateway can integrate directly with Lambda, which by default can access the public resources. Lambda functions can be configured to access your Amazon VPC resources as well. If you have extended your data center to AWS using AWS Direct Connect or a VPN connection, Lambda can access your on-premises resources, with the traffic flowing over your VPN connection (or Direct Connect) instead of the public internet. All the services mentioned above (except Amazon EC2) are fully managed by AWS in terms of high availability, scaling, provisioning, and maintenance, giving you a cost-effective way to host your web applications. It’s pay-as-you-go vs. pay-as-you-provision. Spikes in demand, typically encountered during the enrollment season, are handled gracefully, with these services scaling automatically to meet demand and then scale down. You get to keep your costs in control. All AWS services referenced in the above architecture are HIPAA-eligible, thus enabling you to store, process, and transmit PHI, as long as it complies with the BAA. The ever-increasing presence of IoT devices in the healthcare industry has created the challenges of ingesting this data at scale and making it available for processing as soon as it is produced. Processing this data in real time (or near-real time) is key to delivering urgent care to patients. The infinite scalability (theoretical) along with low startup times offered by Lambda makes it a great candidate for these kinds of use cases. Balancing ballooning healthcare costs and timely delivery of care is a never-ending challenge. With subsecond billing and no charge for non-execution, Lambda becomes the best choice for AWS customers. Typically, these devices are connected to an edge node or collector, which provides sufficient computing resources to authenticate itself to AWS and start streaming data to Amazon Kinesis Streams. The collector uses the Kinesis Producer Library to simplify high throughput to a Kinesis data stream. You can also use the server-side encryption feature, supported by Kinesis Streams, to achieve encryption-at-rest. Kinesis provides a scalable, highly available way to achieve loose coupling between data-producing (medical devices) and data-consuming (Lambda) layers. 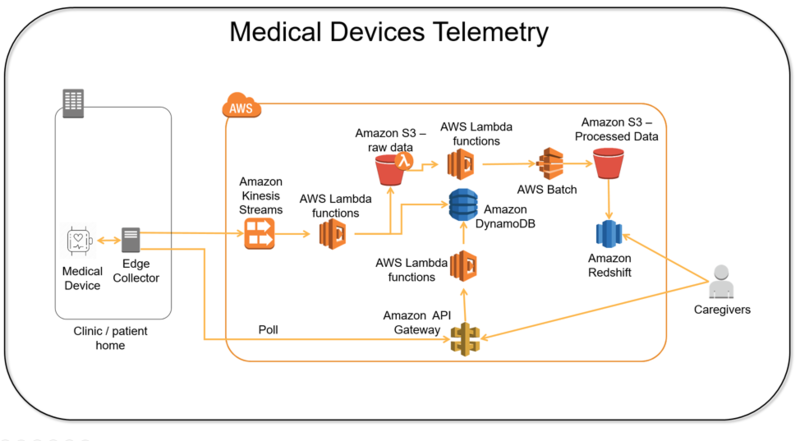 After the data is transported via Kinesis, Lambda can then be used to process this data in real time, storing derived insights in Amazon DynamoDB, which can then power a near-real time health dashboard. Caregivers can access this real-time data to provide timely care and manage device settings. End-user medical devices, via the edge node, can also connect to and poll an API hosted on API Gateway to check for calibration settings, firmware updates, and so on. The modifications can be easily updated by admins, providing a scalable way to manage these devices. For historical analysis and pattern prediction, the staged data (stored in S3), can be processed in batches. Use AWS Batch, Amazon EMR, or any custom logic running on a fleet of Amazon EC2 instances to gain actionable insights. Lambda can also be used to process data in a MapReduce fashion, as detailed in the Ad Hoc Big Data Processing Made Simple with Serverless MapReduce post. You can also build high-throughput batch workflows or orchestrate Apache Spark applications using Step Functions, as detailed in the Orchestrate Apache Spark applications using AWS Step Functions and Apache Livy post. These insights can then be used to calibrate the medical devices to achieve effective outcomes. Use Lambda to load data into Amazon Redshift, a cost-effective, petabyte-scale data warehouse offering. One of my colleagues, Ian Meyers, pointed this out in his Zero-Administration Amazon Redshift Database Loader post. Another use case that I see is using mobile devices to provide diagnostic care in out-patient settings. These environments typically lack the robust IT infrastructure that clinics and hospitals can provide, and often are subjected to intermittent internet connectivity as well. Various biosensors (otoscopes, thermometers, heart rate monitors, and so on) can easily talk to smartphones, which can then act as aggregators and analyzers before forwarding the data to a central processing system. After the data is in the system, caregivers and practitioners can then view and act on the data. In the above diagram, an application running on a mobile device (iOS or Android) talks to various biosensors and collects diagnostic data. Using AWS mobile SDKs along with Amazon Cognito, these smart devices can authenticate themselves to AWS and access the APIs hosted on API Gateway. Amazon Cognito also offers data synchronization across various mobile devices, which helps you to build “offline” features in your mobile application. Amazon Cognito Sync resolves conflicts and intermittent network connectivity, enabling you to focus on delivering great app experiences instead of creating and managing a user data sync solution. You can also use CloudFront and Lambda@Edge, as detailed in the first use case of this post, to cache content at edge locations and provide some light processing closer to your end users. 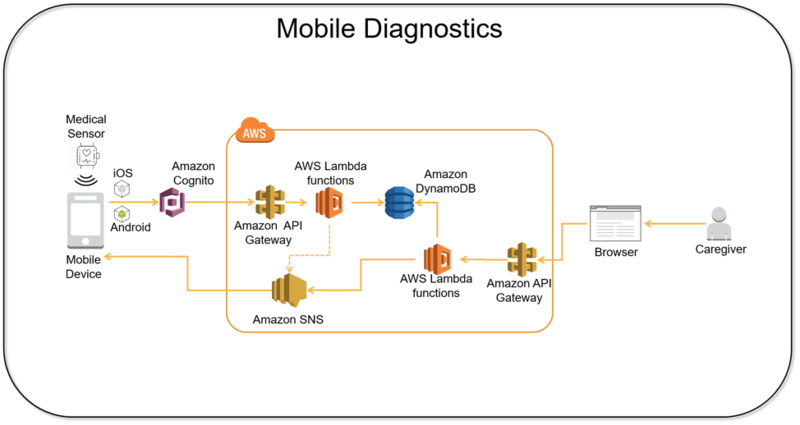 Lambda acts as a middle tier, processing the CRUD operations on the incoming data and storing it in DynamoDB, which is again exposed to caregivers through another set of Lambda functions and API Gateway. Caregivers can access the information through a browser-based interface, with Lambda processing the middle-tier application logic. They can view the historical data, compare it with fresh data coming in, and make corrections. Caregivers can also react to incoming data and issue alerts, which are delivered securely to the smart device through Amazon SNS. Also, by using DynamoDB Streams and its integration with Lambda, you can implement Lambda functions that react to data modifications in DynamoDB tables (and hence, incoming device data). This gives you a way to codify common reactions to incoming data, in near-real time. As I discussed in the above use cases, Lambda is a powerful, event-driven, stateless, on-demand compute platform offering scalability, agility, security, and reliability, along with a fine-grained cost structure. AWS X-Ray is a distributed tracing system that allows developers to analyze and debug production for distributed applications, such as those built using a microservices (Lambda) architecture. AWS X-Ray was recently added to the AWS BAA, opening the doors for processing PHI workloads. AWS Step Functions helps build HIPAA-compliant complex workflows using Lambda. It provides a way to coordinate the components of distributed applications and Lambda functions using visual workflows. AWS SAM provides a fast and easy way of deploying serverless applications. You can write simple templates to describe your functions and their event sources (API Gateway, S3, Kinesis, and so on). AWS recently relaunched the AWS SAM CLI, which allows you to create a local testing environment that simulates the AWS runtime environment for Lambda. It allows faster, iterative development of your Lambda functions by eliminating the need to redeploy your application package to the Lambda runtime. For more details, see the Serverless Application Developer Tooling webpage. There are numerous other health care and life science use cases that customers are implementing, using Lambda with other AWS services. AWS is committed to easing the effort of implementing health care solutions in the cloud. Making Lambda HIPAA-eligible is just another milestone in the journey. For more examples of use cases, see Serverless. For the latest list of HIPAA-eligible services, see HIPAA Eligible Services Reference.